The Plio-Pleistocene sedimentary deposits of the Lower Awash Valley (LAV) in the Afar region of Ethiopia have yielded a vast amount of hominin fossils indicating that maybe up to three hominin species inhabited the LAV during the middle Pliocene (ca. 3.4-3.6 Ma), that the most common late Pliocene hominin, Australopithecus afarensis, is no longer found in the LAV after 2.95 Ma, and that Homo probably evolved earlier than previously thought (ca. 2.8 Ma). One important issue is to understand what were the habitats occupied by early hominins in the LAV and what influence, if any, did habitat change had in early hominin evolution. In order to gain insights into this topic, researchers have examined the changes through time in faunal communities to which hominins belong. One faunal group in particular – the Suidae (pigs, hogs) – has been very informative in this and other paleoanthropological issues. The main reason why suids are so useful in these endeavors is that they evolved very rapidly in response to habitat change and they are usually found in great abundance at all major fossil hominin sites, such as those in the LAV. 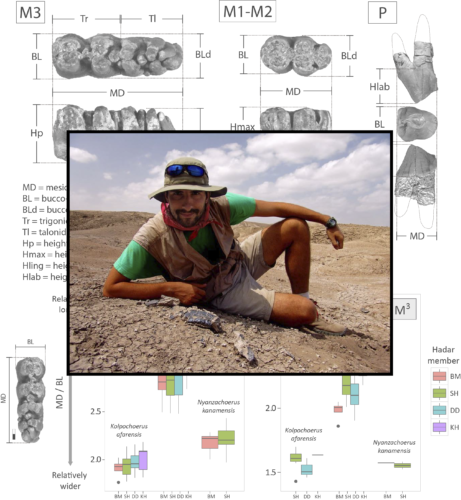 During the development of my PhD research I have been studying suid fossils from three sites from the LAV: Woranso-Mille, Hadar, and Ledi-Geraru, which together contain an almost continuous and stratigraphically-controlled fossiliferous sequence between 3.8 Ma and 2.3 Ma. 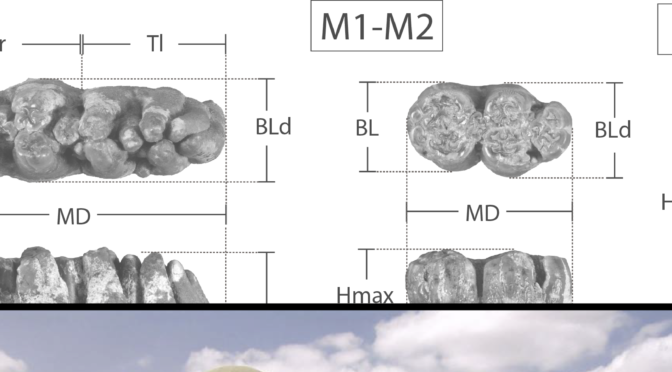 The taxonomic, morphometric, and paleoecological (carbon stable isotopes and dental microwear) description of the abundant craniodental and postcranial material will allow for a better understanding of how different suid lineages were evolving in response to habitat change. Preliminary results indicate a possible alternation of mosaic habitats during the middle to late Pliocene, and a trend towards aridity and/or more open habitats towards the latest part of the Pliocene and the early Pleistocene that may have catalyzed the evolution of early Homo or its migration into the region. This time period is marked by the appearance of suid taxa that were not present in older deposits and that are also the earliest fossils of these taxa registered so far in the region.